There are a number of land use applications that must appear before the land use commissions. A Site Plan/Special Permit Application is required for all new commercial and industrial development in the community as well as other single family development in the residential areas of town. Forms and checklists are available at the Planning Office, and a pre-application meeting with the Town Planner is recommended. As a part of the process, the Town will advertise these applications in a legal notice in the newspaper and the applicant will notify property owners within 100 feet of the property. The applicant will attend the public hearing and explain to the Commission his project and how it meets the Town regulations. Town staff reports will be provided, the Commission will ask questions and the public will have an opportunity to speak. The Commission will review how the project complies with the Plan of Conservation and development, the Zoning regulations, and other criteria found in Section 8 of the Zoning Regulations such as: impacts on the neighborhood, traffic and storm water considerations; and, effects on the public health, safety and welfare. Applications are required to the Planning and Zoning Commission for any proposal to subdivide a lot or parcel of land into three or more lots. 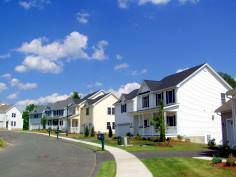 The Town Subdivision Regulations contains the standards to which all subdivision applications must adhere. The Commission role is to hear the applicant and determine if all Zoning and Subdivision Regulations have been met; and, to determine if the plan complies with the Plan of Conservation and Development. Application forms and checklists are available at the Planning Office, and a pre-application meeting with the Town Planner is recommended. As part of the process, the Town will advertise these applications in a legal notice in the newspaper and the applicant will notify property owners within 100 feet of the property. This is a process established by the Connecticut State Statutes that allows a property owner to apply to the Zoning Board of Appeals to vary the application of the zoning regulations on a particular piece of property. The process requires a public hearing before the Zoning Board of Appeals. The applicant must submit an application, fees, and a site plan showing the proposed use that requires the variance. The Town advertises the application in a legal notice in the newspaper and the applicant must send a notice to all property owners within 200 feet of the property. The variance will be generally consistent with the Plan of Conservation and Development.